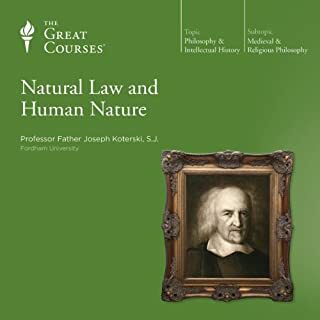 Natural law is the idea that there is an objective moral order, grounded in essential humanity, that holds universal and permanent implications for the ways we should conduct ourselves as free and responsible human beings.These 24 in-depth lectures consider the arguments for natural law, the serious objections that have been raised against it, and the ways, despite all overt criticisms, it remains a vital and even pervasive force in political, moral, and social life today, even while traveling under another name. I was worried at first that a Priest would stick to the Catholic Doctrines (I am Catholic myself). But, Fr. Koterski gave a very fair presentation of this most interesting subject. He was very good, no excellent as narriatior as it was very clear to me that he had a firm grasp of the subject matter. An excellent read. 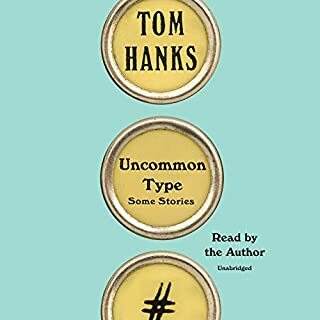 A collection of 17 wonderful short stories showing that two-time Oscar winner Tom Hanks is as talented a writer as he is an actor. The short stories are surprising, intelligent, heartwarming, and, for the millions and millions of Tom Hanks fans, an absolute must-have! I realize that perhaps not everyone likes Short Stories, but as a mid 70 year old senior, I do.I listen a lot at bed time so I tend to far asleep with long books. I think Tom Hanks did a very commendable job with this collection of Short Stories. I enjoyed them all. A short story comes in handy during a long wait in a doctors office, or on a car trip. I KNEW This Book Would Sting Me . . . .
Would you listen to Hue 1968 again? Why? I am A 1960's Marine.I have read many Viet. era Books but this one is far & away the best! I have listened twice & will do so again later. The author tells it just as I lived it. 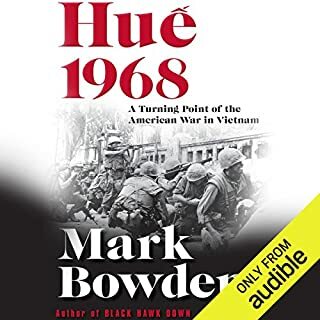 What other book might you compare Hue 1968 to and why? No, this is my first Joe Barrett experience but I signed on today to check out his other offerings. This Hue (Way) Book won my heart! The end of the Book was so stirring that I listed to it once again after my first my first listen. I have never heard words so accurate as to how the whole war was conducted. The honesty made me see for the first time. I have nothing but full & complete respect for all the Vets who served in that war. They are all patriots! I hope many of them give this account an honest listen. The Vets of Vietnam all went as they truely believed it was their duty. God Bless them all. 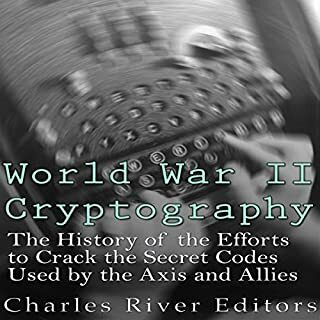 World War II stood apart in many ways from every earlier war, not least in the way that it reached to every corner of the planet and involved a noticeable segment of humanity's collective resources. Battles erupted not only on land and the sea's surface as they had for centuries, but also in the ocean depths and the windswept heights of the sky. One of the war's most crucial struggles happened in the realm of the unseen, inside the human mind and amid the invisible flow of radio waves. I listen on an iPod & an iPhne 6. To get an idea as to how fast this Book is read place your iPod on "Fast"! I had a hard time following. Might be nice in a car for short drives. What three words best describe Scott Clem’s performance? Autumn, 1837. Driving onward - against the worst of man and nature - a legendary caravan of men, women and children forge a new link in the wilderness trek from Independence, Missouri to the "Promised Land" beyond the Rockies. They are pioneering Americans from North and South - side-by-side with immigrants, a Black man and an Indian - waging a fierce daily battle for bare survival on an uncompromising journey to their private destinies and the fulfillment of America's greatest dream. If you could sum up Nebraska! in three words, what would they be? I listen mostly at night as at times I have a sleep problem. 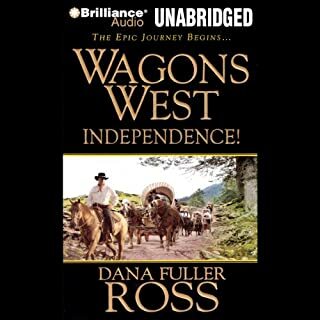 I like this Dana Ross series as they are just plain interesting & fun to learn about how people did things back in the pre Civil War days. No super markets, shot your own meat, gather water (not in plastic) & so on. The story line is very interesting with plenty of gun fights. A wholesome listen. How the women in the wagon train began to blossom & harden up to the circumstances, including learning to shoot. What about Phil Gigante’s performance did you like? No crying, just full attention. A good read. Folks with an interest in early America & the settling of the west will enjoy this series. Plus, the price is right! The early 20th century was a time of sudden growth for the young American automobile industry, and of a military beginning to extend its reach around the world. In what would become largely a jurisdictional dispute over Western natural resources, the unbridled oil industry of the new century collided with the United States military and the Department of the Interior, set against the dominance of a corruption-riddled presidential administration. So That is What it was All About! 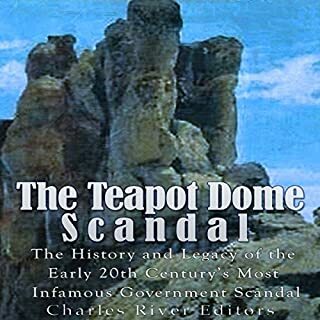 What made the experience of listening to The Teapot Dome Scandal the most enjoyable? I had heard of this scandal many years ago yet I never knew what it was all about. Now I do! The then President, from Ohio. My State! How corrupt things were back then, & still are! What about Scott Clem’s performance did you like? Not much, I wanted to know the facts behind this scandal. No reaction except how big business is always influencing government to the detriment of society as a whole. The year is 1837. The American West is untamed, uncivilized, and largely unclaimed. U.S. President Andrew Jackson, in a race with the British and Russians, sends a wagon train of would-be settlers into the uncharted Oregon territory, led by his close friend, mountain man and veteran Sam Brentwood. Where does Wagons West Independence! rank among all the audiobooks you’ve listened to so far? Being retired & not driving any more I find Books like Wagons West to be most relaxing. I chose Audible Books over radio & TV, no commercials. I enjoyed the cast of characters, a microcosm of the then society! What was one of the most memorable moments of Wagons West Independence!? How the Wagon Train leader overcame the last obstacle. He did a very good job reading. No, I usually fall asleep & continue later. My Books last longer that way. I am checking out Volume 2 now. 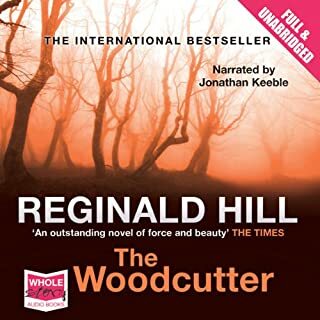 One of my favorite Reginald Hill books! 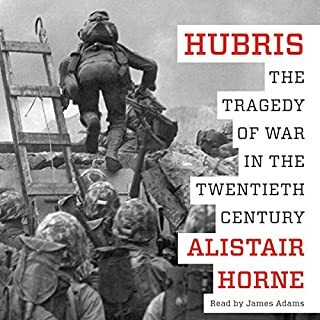 Sir Alistair Horne has been a close observer of war and history for more than 50 years, and in this wise and masterly work he revisits six battles of the past century and examines the strategies, leadership, preparation, and geopolitical goals of aggressors and defenders to reveal the one trait that links them all: hubris. I Never Heard W ll Explained this Way! Where does Hubris rank among all the audiobooks you’ve listened to so far? My favorite character was the Russian General Zhukov & his handling of the little know 1939 battle with the Japanese in Manchuria, a very bloody affair! This set the stage for the Russian General's actions in the soon to come WW ll & was the main reason Japan decided not to attack Russia during the 1940's allowing Russia to send his eastern army against the German advance on Moscow! I will now look at history's great Wars to see if the parties involved studied history! I know most did not & then paid a high price. Which character – as performed by James Adams – was your favorite? Finally, someone (James Adams) gave a forthright reading of the King of Hubris, General McArthur! How Big Battles are Lost! I loved "After a Win, Tighten Your Chin Strap"! How true! What different kinds of books are in the New Testament? When, how, and why were they written? And why did some books, and not others, come to be collected into what Christians came to consider the canon of scripture that would define their belief for all time? With these 12 lectures, get a fast-moving yet thorough introduction to these and other key issues in the development of Christianity. A Biblical History that is Most Interesting! 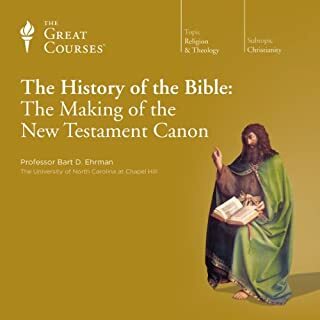 Would you listen to The History of the Bible: The Making of the New Testament Canon again? Why? Prof. Bart Ehman, is at least to me, is who makes an interesting subject very understandable. He is very neutral in his delivery & while also being very thorough. I am 73 & have never understood the Bible. The Great Courses are most helpful to me as I very much enjoy the academic approach. So far I have purchased some 10, or more, Great Courses books. Prof Ehman is so interesting to me I will soon listen again. I have another of his to listen to first. He is excellent! Paul is my favorite character as he appears after the life of Christ. In fact Paul seems to have taken the lead over the Gospel writers. Have you listened to any of Professor Bart D. Ehrman’s other performances before? How does this one compare? No, to my this was my first experience with Professor Ehrman, but I will check. At any rate he was very, very good! I am very glad I have found the "Great Courses" as they allow me to be exposed to many subjects from science to religion that I missed in my youth! I enjoy the Great Courses very much.